Like a lot of other gamers I've been hearing chuckles of wicked glee surrounding the adventure path Way of the Wicked from Fire Mountain Games (if you have no idea what I'm talking about, check it out right here). Not only is it a well-written level 1-20 campaign, but it is a game specifically geared toward evil PCs. It's a game where you get to open up that restricted door and let out the serial killers, the cultists, the brutes, the monsters, and all the other villains that lurk in your shadow's subconscious. So naturally, that got me thinking about what I'd like to play in an evil campaign. So, when presented a chance to bring any terrifying monster I have locked up in the depths of my mind, I decided I should bring this. The guy on the left is the one I'm talking about. 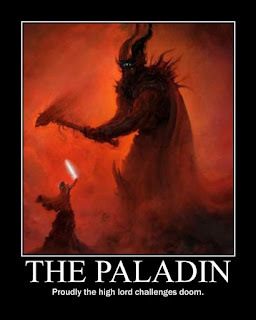 In the spirit of my entry about The Android Barbarian, I'd like to discuss my idea of the Risen Antipaladin. In the long ago and far away there was a book that sensible DMs kept out of their players' hands; The Book of Exalted Deeds. That book was full of feats and spells of such holy power that they would melt the flesh from the bones of devils, and bring light to the deepest darkness of hell. 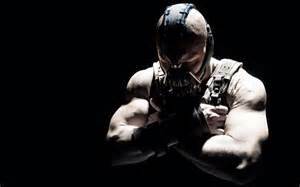 In the flavor section, the book laid out the basic archetype of the redeemed villain. It is what you think it is; a character who has lived a life of bloodshed, violence, and corruption, but who has turned their back on that life to do good deeds. 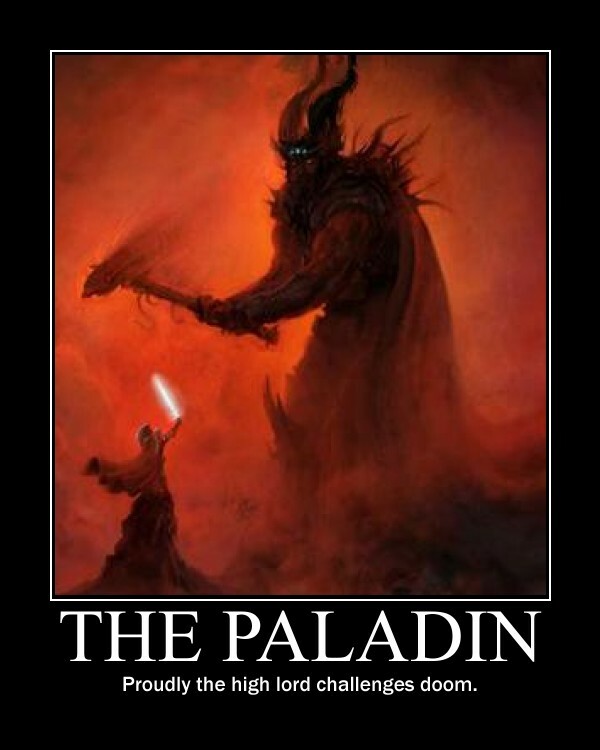 The Advanced Player's Guide gave us the antipaladin as the exemplar of evil; a warrior who holds no regard for life, liberty, or the well-being of others. Terrible to behold, and powerful beyond belief, antipaladins are often made from fallen paladins... but sometimes they're not. Sometimes, as you see on page 121 of the APG, antipaladins are rigorously trained for that specific life. In some cases they may even be bred for the role that they'll be forged to fill. While an antipaladin may turn his back on the pain and horror that made him who he is, those things still live inside him. He may try to keep them at bay with prayers, and to smother them beneath the weight of good deeds, but he'll always know what he was... and what he might be again. For Way of The Wicked you begin the game with a prison break. You're all bad guys, and so it makes sense for you to throw in together to get out of this place. Then in walks the new fish. A few weeks ago he was the empire's golden boy; a blade of light, and a shield against evil. Then it came out who he really was, and despite all the good deeds he'd done, he was locked up for the terrible crimes he could never wash out. Maybe some of the villains were arrested by him when he was called the Hammer of Justice, and was a force for good in the empire. 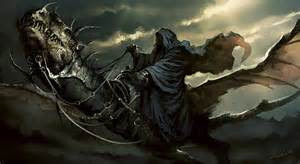 Maybe some of them know him better by his old names; the Bloody Knight, the Bone Burner, or the Shadowman. The right hand of the devil himself, there were some who said that as long as he did the infernal lords' bidding that he couldn't be killed by mortal weapons. That he'd fallen a hundred times, always to rise and wreck bloody vengeance on those who had caused him pain. A man born and raised in darkness. Could your villains truly turn down the help of such a powerful ally? Especially if, as some suspect, that his black heart beats closer to the surface than you'd think? There are a lot of ways you can set this situation up. Long-lived characters like elves and dhampir are ideal for those who were once terrible villains, and who have tried to bury that past behind them for many years. Tieflings and aasimar have infernal and divine blood, which can add into the story of struggle to define oneself. Humans are perhaps the simplest, and as paladins (or antipaladins) they'd greatly benefit from the Eldritch Heritage feat tree (more on that feat tree in How To Power Up Your Pathfinder Characters With The Eldritch Heritage Feats). My particular favorite for this setup is a human paladin with the Infernal eldritch heritage. You have someone who, before he was even born, was being pushed onto the left hand path, and it's only been through sheer will and refusal to let go that he's managed to hang onto the grace he's found at the end of his repentance. While it might seem like a noble struggle, in an evil campaign it's only a matter of time until your hand is forced. Sooner or later you'll wade through enough filth that your grip on grace will slip, and you'll fall. And when you fall you're going to fall very, very hard. We're talking ALL the way down. That sort of thing is to be expected, and it's part of the challenge of the concept. The goal is not to make it through an evil campaign while playing a paragon of virtue; the goal is to see how far you can get before you take that plunge. And if you see your fellow players sniggering and elbowing each other, planning to drag your down off that plinth before you or your story is ready, just deliver a little in-character speech that goes something like this. "They say the Bloody Knight's blade was never dry. That he would quench that steel in whomever was near to hand at the slightest provocation. Even his own allies. He was a man who would cut the tongues from those who disagreed with him, and who would cripple those he thought less than worthy. He was a creature of suffering, torment, and agony, whom even demons groveled and sniveled before. Tell me truly, do you really want that man to be sitting here by the fire when you sleep tonight?" A fun little hat trick for this concept requires you to get your DM's assistance in one, major manner. You need to give yourself a liege lord, and take the Absolute Loyalty trait at creation. That way you get a get-out-of-falling-free card you can use once and only once to cast atonement on yourself, assuming that what you're doing is at the behest of your lord commander. The trait implies you need to do it immediately, but with storyteller permission you might be able to hold onto it until an appropriately climactic moment so that you can slam the door shut on the fiend, and return to grace. Even if you don't go that route, though (or do something equally cheap like recruiting a cleric to cast atonement on you once you reach a high enough level), there's nothing that says you have to remain wicked. You redeemed yourself once, and you can do it again... but some situations really do call for a monster. If you liked this character concept, tell all your friends about it! If you decide to try it out, either in a regular game or in an evil campaign, tell me how it went! Lastly, if you'd like to keep the ideas flowing then stop by The Literary Mercenary Patreon page to toss a little bread in my jar. If you'd like to keep up on all my other updates then just follow me on Facebook, Tumblr, or Twitter at your leisure. Wow. Cool idea, but I have no idea how someone could pull it off. That's what I was thinking... Seems unrealistic that someone could pull it off, but I'd be gladly proven wrong. If someone does it, share your story! The Saga of Majenko: Blood Pig Champion! Support Improved Initiative and Get Free Stuff!